Busy July boosts GPA container trade 12.7 percent – Panama Gateway International Association, Inc.
Panama Gateway International Association, Inc.
Savannah, Ga. – The Georgia Ports Authority moved 378,767 twenty-foot equivalent container units (TEUS) in July, an increase of 12.7 percent, or 42,668 TEUs, compared to the same month last year. 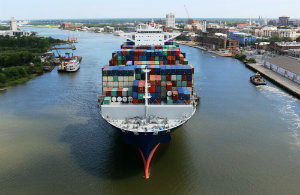 It was the second busiest month on record for the Port of Savannah. “July was an incredible start to our fiscal year, with double-digit growth across our container, breakbulk and dry bulk operations,” said GPA Executive Director Griff Lynch. In Fiscal Year 2018 (July 2017-June 2018), rail cargo at Garden City Terminal increased by 16 percent (60,000 containers) for a total of 435,000 intermodal rail lifts. July continued that trend, with the busiest month on record for intermodal cargo, at 41,070 container moves, for an increase of 20.8 percent (7,087 containers) compared to July 2017. Since Fiscal Year 2016, the GPA has seen its container trade grow by nearly 16 percent, or an additional 560,000 TEUs. However, turn times for motor carriers and rail operations have not increased. Allgood said GPA’s increasing trade has positive ripple effects throughout Georgia’s economy. Total GPA tonnage in July grew by 10.5 percent, or nearly 300,000 tons, for a total of 3.15 million tons. Breakbulk tonnage crossing all docks increased by 14.4 percent (33,494 tons) in July for a total of 265,891 tons of cargo. At East River Terminal in Brunswick, bulk cargo grew by 43 percent. Terminal operator Logistec moved an additional 29,670 tons last month, for a total of 98,483. In roll-on/roll-off cargo, the GPA handled 53,419 units of autos and machinery, an increase of 5 percent, or 2,610 units, compared to July 2017. Colonel’s Island Terminal at the Port of Brunswick moved the majority of that Ro/Ro cargo, accounting for 50,850 units of the total. Georgia’s deepwater ports and inland barge terminals support more than 439,000 jobs throughout the state annually and contribute $25 billion in income, $106 billion in revenue and $2.9 billion in state and local taxes to Georgia’s economy. The Port of Savannah handled 8.5 percent of U.S. containerized cargo volume and 10 percent of all U.S. containerized exports in FY2017. 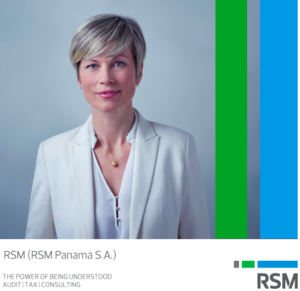 This brochure about RSM Panama, S.A. offers information regarding the team approach the firm’s specialists take to transparently understanding, supporting and meeting their clients’ needs. This book, edited by Juliette Passer, offers information about opening a business in Panama or expanding an existing business in this critical crossroads-of-the-world hub for international trade. Click here for a free download. Panama Gateway is the single best source of information about doing business in, through, and with Panama and throughout the international business community. Read our FAQ to find out the benefits of joining. Please email RSM Panama, S.A. with questions, comments or requests.